Thank you to Steven Oliver for allowing me to reproduce this photo. "Here is Dean Bridge in April 2010, showing the two old lamp posts still currently on the bridge. - The one on the right is a Falkirk Iron Co example." 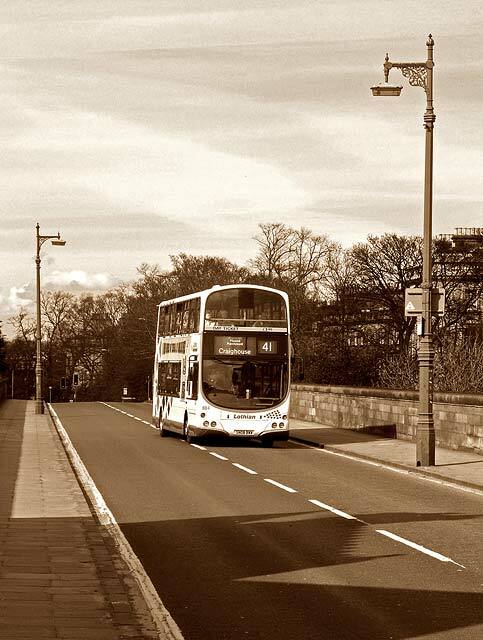 "There was a third old lamp post, on the NE side of the bridge (behind the bus in the photo), until a few years ago when it was hit by a lorry and flattened. It was also a MacKenzie & Moncur column, and has (as of January 2011) not yet been replaced. The column on the right in the photo previously stood in Newington, on the corner of Lutton Place and Oxford Street. but was moved to Dean Bridge in late-1989 to replace a MacKenzie & Moncur slimline column. When Lutton Place and the neighbouring streets were re-lit in the autumn of 1989, this column had its lantern removed before being lifted out of the ground and transported by lorry to the Dean Bridge. Once there, it was sited, connected, had a new lantern fitted, and was working within a few days. This recalled the practice, during the 1920s and 1930s, when many similar columns around Edinburgh were moved to new locations following construction of the tram system, including the old lamp post at the foot of Glenfinlas Street."